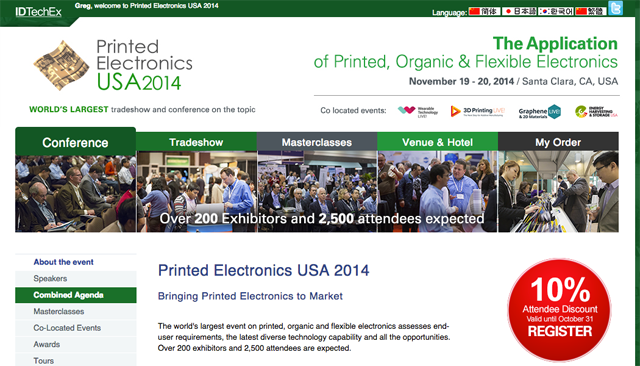 There is an emerging market that we just fell in love with - Printed Electronics. This can be a game changer from wearable technology to display technology. We interview Raghu Das, CEO of IDTechEx, whose company is putting on this show, Printed Electronics USA 2014, on November 19-20 at the Santa Clara Convention Center. This show will highlight the current and future direction of Printed Electronics. Printed Electronics is a market where traditional printing technologies using conductive ink and flexible substrates to create functional electronic circuits. Raghu's company does research and business intelligence for emerging markets like Printed Electronics. Watch Raghu why he thinks Printed Electronics is a great emerging market. "Printed Electronics is just like what electronics was to the vacuum tube"
"We see this a a major next step in electronics...similar to what was like 40 or 50 years ago, electronics is they're bulky, they're brittle, they're thick and rigid devices which has to be encapsulated...printed electronics offers a completely new form factor...we are talking about devices can go on flexible substrates"
"We can see the strap of the new watches be a battery"
Join us for an opportunity to interact with Raghu and learn about how to get a Masters in Printed Electronics at Cal Poly University. Find out more here.